"My inspirations involve qualities of chance, emergent complexity, interdependent and dynamic relationships found in nature and society, coupled with our innate love of chance, underscored with the acquired urge to control, manipulate and predict outcomes." Baker & McKenzie, Frank O. Gehry building, Düsseldorf. 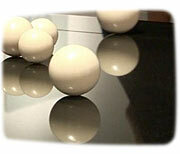 Illusions in Space, Sculpturesite Gallery, Berkeley, USA. New York Times, The Village Voice. • TV Berlin, news hour culture section. broadcast coverage of “Art Berlin”, 2001. • WDR Kulturszene, TV culture broadcast coverage of “Kunst Köln”, 2001. • Sandra Balvín, Sur (newspaper) 29.10.2005, “Un mundo por descubrir”, pp. 12. • José Luis Tobalina, EuropaSur (newspaper) 29.10.2005, “La imagen fotográfica como filosofía”, pp. Cover, 64. 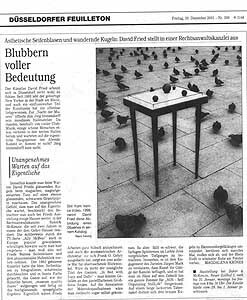 • Magdalena Kröner, Rheinescher Post, (newspaper) „Blubbern voller Bedueutung“, 28.12.2001. 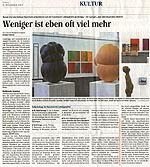 • Sigrid Blomen-Radermacher, Rheinescher Post, (newspaper) „Kunst nach Stammzellen-Art“, 08.05.2007. 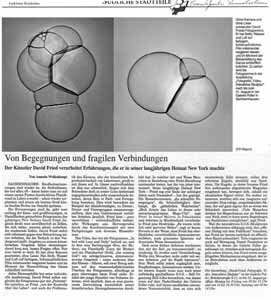 • Annette Wollenhaupt, Frankfurter Rundschau, (newspaper) „Von Begegnungen und fragilen Verbindungen“, 08.08.2002. 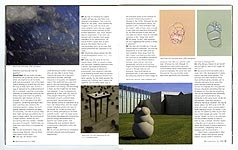 • World of Art Magazine, Issue 6, Vol.3, 2003. 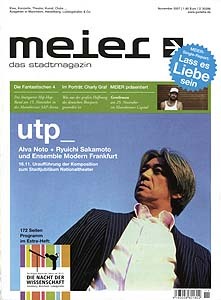 • Manheimer Morgen, (newspaper) „Kultur“, 09.18.2006, pp.31. • “In to the Nature” ISBN-13: 978-3-89955-099-3 (Softcover 2007: pp.192-195) Die Gestalten Verlag, Berlin. • Manheimer Morgen, (newspaper) 05.12.2007. „Vom Wesen des Zufalls“ review of exhibition at Projektraum4 / Galerie Kasten. pp.27. • Barbara Foester, Manheimer Morgen, (newspaper) „Weniger ist eben oft viel mehr “, 09.11.2007, pp.31. 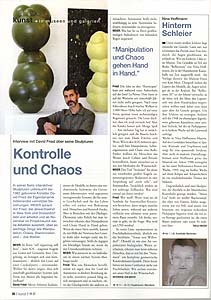 • Eva Mayer, Meier Magazine – Heidelberg/Manheim, 11.2007 (interview) „Kontrol und Chaos“ pp.86. • Christopher Hart Chambers, dART magazine, Vol 9 - No.2, 2006. 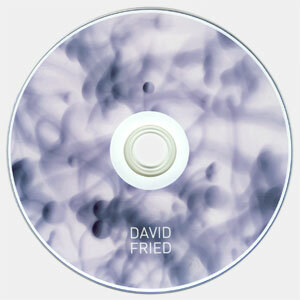 “Confined Chaos – Life according to David Fried“. pp. 25-27. • Kirsten & Lukas Feireiss (2008) “Architecture of Change - Sustainability and Humanity in the Built Environment” (ISBN:978-3-89955-211-9).Rainscapes on inside front and back covers (Hardcover pp.00,01,311,312) Die Gestalten Verlag, Berlin. • "Scuplture in Motion", PBA / Public Broadcasting Atlanta, Program & Interview aired July 2008. 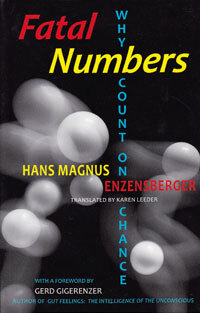 • Westside Philosophers, Inc, "Fatal Numbers: Why count on Chance" by Hans Magnus Enzensberger (Softcover 2010: Front & Back Cover & insert.) Translated from original German "Fortuna und Kalkül" edition Unseld. • ArtInvestor Magazine, No.06/12, pp.69,70. "Dynamische Kunstobjekte" Dominique Dabrowski. • Rheinische Post, Duesseldorfer Kultur Magazin C3, 8.März 2015. 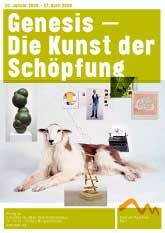 Die Grosse kunstausstellung 2015 "Marktplatz im Museum" von Annette Bosetti. 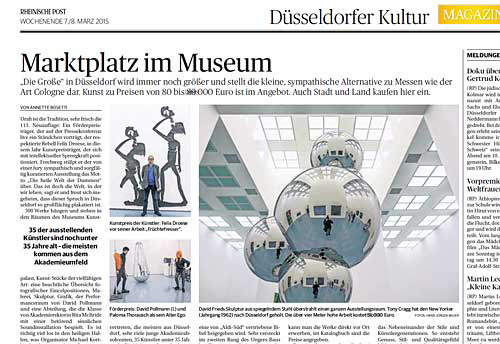 • Rheinische Post, Duesseldorfer Kultur Magazin C3, 14.Mai 2015. "Reise in die Unendlichkeit" von Noatascha Plakermann. • WDR 1, Kultur, "Das All im Weltkunstzimmer" Thomas Köster. 1. February 2017. Born and raised in New York City, the artist David Fried found his calling early on. He was accepted as the first minor ever into the adult classes at the Art Students League where he had his first chance to expand his artistic horizons. Between the age of 8 and 13, beyond mastering traditional and established contemporary styles, he painted in oil with a visionary style of his own that earned him numerous awards and public solo exhibitions as a youngster. Soon after his early departure from the academic world, he co-founded the artist‘s consortium known as ‘Avant’, which along with Haring and Basquiat, were major contributors to the emerging New York street-art scene. 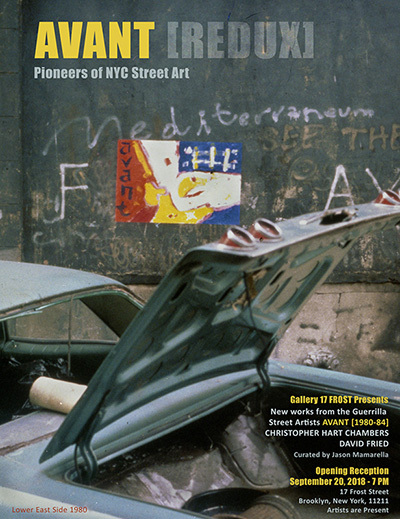 His notorious illegal public paintings led to inclusions in dozens of gallery exhibitions in soho and the east village throughout the early to mid 80‘s. Fried‘s fascination with specifically human relationships present in his early figurative paintings led to deeper insights into complex relationships in general, which soon crystallized as the conceptual core for all his forthcoming artistic endeavors. His hands-on research led to a panache of traditional, state of the art and invented techniques. He simultaneously pursued his art and studied philosophy, primitive mythology, life sciences and aspects of technology and mass media in our cultures. In 1989, shortly before the Berlin wall came down, Fried moved his studio to Germany where he sought Europe‘s entwined cultural distinctions and social dialogue to inspire and explore his increasingly scientific and philosophic brand of art. 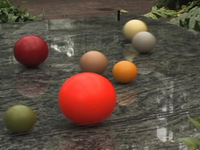 There his work developed from painting and photography into his own morphology of techniques and processes such as ‘light sensitive paint’, ‘interactive granite’ and sculpture, to depict and fabricate his conceptual explorations. Since then his artwork has followed several distinct avenues that are disparate in actualization yet united in sensibility. His international art career began in earnest several years after relocating to Europe with his first major solo exhibition in Cologne, Germany. Soon after he was invited to use Immendorff‘s event space for an exhibition and performance for the ‘Night of the Museums’ in Düsseldorf. 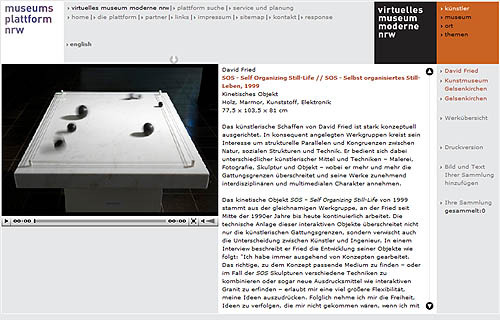 Fried has mounted several solo exhibitions in galleries, institutions and museums across Europe and has exhibited on 4 continents. 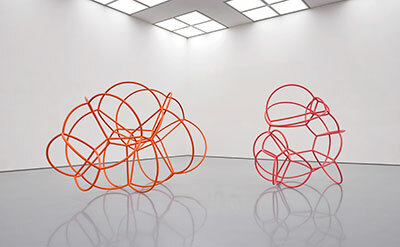 His work can be found in the permanent collections of Volksbank HQ, Mönchengladbach, Germany, Kunst Museum Ritter, Waldenbuch, and in Gemany‘s most extensive kinetic art collection at the Kunstmuseum Gelsenkirchen. 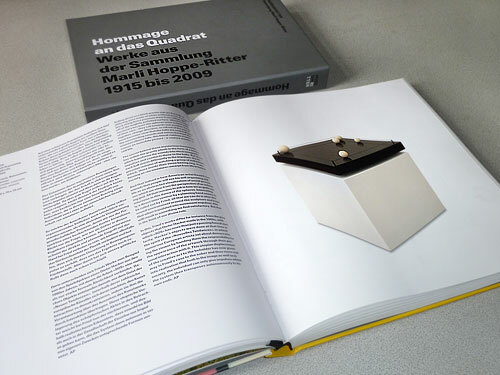 Additionally, he has been shown alongside that of Rebecca Horn, Rauschenberg and Calder in the traveling exhibition ‘Drehen, Kreisen, Rotieren’, and he was also featured in ‘Genesis—The Art of Creation’, alongside Antony Gormley, Bruce Nauman, LeWitt and others at the Zentrum Paul Klee in Bern, Switzerland. 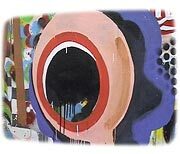 In September 2007 he returned to NYC with a solo debut at Gallery Sara Tecchia in Chelsea New York. 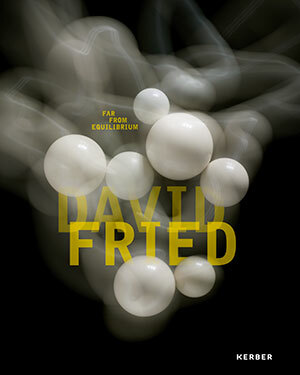 David Fried currently lives in Germany and works in Düsseldorf and in New York City. The multidisciplinary artist David Fried (1962, NYC) explores the qualities of invisible complex dynamic relationships in the form of minimalistic images and objects. The inherent flexible characteristics of interdependent networked systems operating far-from-equilibrium found in nature and social endeavor, are echoed throughout his sculptural, photographic and interactive works. The artist employs highly symbolic motifs that are universally recognizable as organic or pertaining to natural phenomena with chaotic tendencies, contextually infused with hints of human influence and our urge to control, manipulate and predict outcomes. 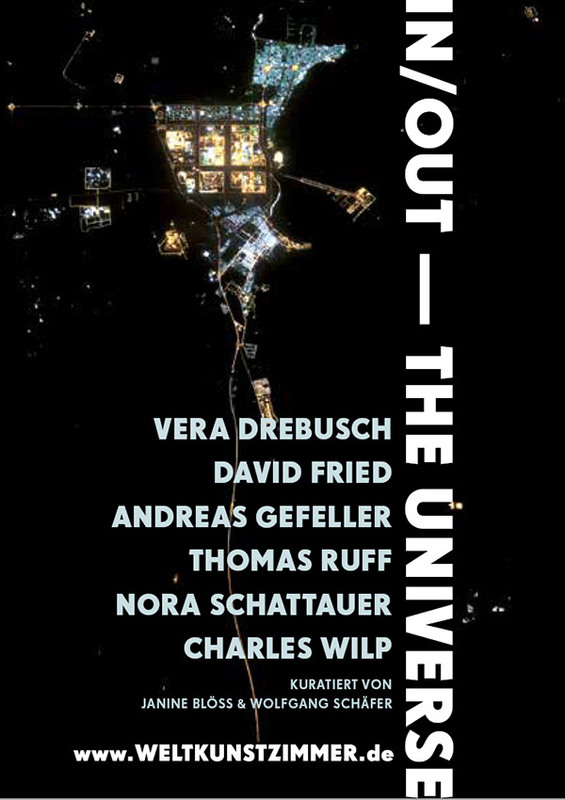 In a human world that is increasingly aware of and witness to the influence of self-organizing systems, Fried explores the space between the lingering anachronism of the linear, clockwork world view and the vandgarde of progressive systems thinking on diverse themes such as communication, sociology, ecology and biology. 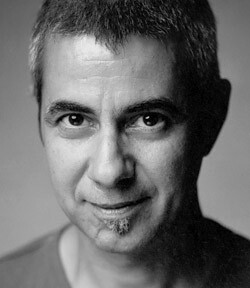 His essential inspirations value unpredictability, emergent complexity and influence over the illusion of true control. Adding to the lucid sense of harmony and sensual aesthetic found in his compositions, Fried draws eclectic references from mythological and scientific realms, which are universally present in individual psyches. Much like the ancient’s archetypical signs, he condenses complex contemporary issues into enigmatic symbols that mark pivotal changes in our societies and consensus, whereby fact and fiction become one. 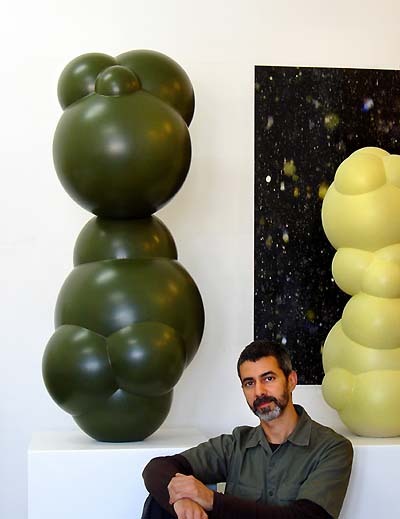 His recent works, consisting of modernized fertility icons, photographs of celestial forces, photograms of cellular membranes, networks and interactive stone sculptures, are fabricated using traditional techniques combined with high-tech processes in a variety of mediums. He synchronizes diverse artistic and scientific disciplines to create contemporary icons that reflect our growing knowledge base in the techno-information era, while emphasizing the affects technology itself has on our personal choices and belief systems. Fried‘s personal catalytic mix of critique and philosophy, his respect for the unpredictable and non-linear networks, dialogue, art and the sublime, form the core of his various unique projects. Processing these factors into an artistic unity, the artist fuses minimalism and conceptual art with aesthetics and philosophy to create works that aim to transcend diverse cultural boundaries. In his comprehensive work, Fried suggests that the mythological and the scientific involve inextricable systems of belief that must remain in constant dialogue, as art follows life and life follows art. Der interdisziplinär arbeitende Künstler David Fried (1962, NYC) erforscht in seinen minimalistischen Bildern und Objekten die Eigenschaften unsichtbarer, komplexer, dynamischer Beziehungen. Die innere Flexibilität wechselseitig vernetzter und alles andere als ausgewogen operierender Systeme, wie sie in Natur und sozialen Beziehungen vorkommen, durchzieht sein gesamtes skulpturales, fotografisches und interaktives Werk. Der Künstler verwendet symbolstarke Motive, die universell als organisch und als bezogen auf Naturphänomene mit chaotischen Tendenzen lesbar sind, kontextuell ergänzt durch Anspielungen auf menschliche Einflussnahme und unseren Drang, Resultate zu kontrollieren, zu manipulieren und vorherzusagen. 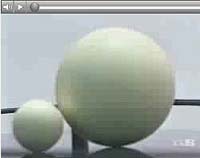 In einer menschlichen Welt, die sich des Einflusses selbstorganisierender Systeme heute zunehmend bewusst wird, erforscht Fried den Raum zwischen noch immer verbreiteten Anachronismen einer Newton’schen Weltsicht und der Avantgarde eines fortschrittlichen Systemdenkens, wobei er so unterschiedliche Themenfelder wie Kommunikation, Soziologie, Ökologie und Biologie einbezieht. Seine grundlegenden Ideen würdigen Unvorhersehbarkeit und Zunahme von Komplexität und Einfluss gegenüber der Illusion von echter Kontrolle. Neben dem klaren Gefühl für Harmonie und sinnliche Ästhetik, das seine Kompositionen kennzeichnet, stellt Fried vielfältige Bezüge zu mythologischen und wissenschaftlichen Themengebieten her, die in der individuellen Psyche universell präsent sind. Ähnlich wie bei Archetypen des Altertums verdichtet er komplexe, heute wichtige Themen zu enigmatischen Symbolen, die entscheidende Veränderungen unserer Gesellschaften und Übereinkünfte markieren, wodurch Fakt und Fiktion eins werden. Seine neueren Arbeiten, die von modernisierten Fertilitätssymbolen über Fotos von himmlischen Mächten, Fotogrammen von Zellmembranen, Vernetzungen bis zu interaktiven Steinskulpturen reichen, umfassen eine Vielzahl von Medien und verbinden traditionelle Techniken mit Hightech-Verfahren. Er führt verschiedene künstlerische und wissenschaftliche Disziplinen zusammen, um zeitgemäße Symbole zu erschaffen, die unsere ständig anwachsende Wissensbasis im Zeitalter der Informationstechnologie reflektieren und auch den Einfluss hervorheben, den diese Technologie selbst auf unsere persönlichen Entscheidungen und Vorstellungswelten hat. Frieds eigener, katalytischer Mix aus Kritik und Philosophie, seine Wertschätzung des Unvorhersehbaren, von nichtlinearen Verknüpfungen, Dialog, Kunst und dem Erhabenen bildet den Kern seiner vielen einzigartigen Projekte. In der künstlerischen Zusammenführung dieser Faktoren verschmilzt er Minimalismus und Konzeptkunst mit Ästhetik und Philosophie und erschafft Arbeiten, die darauf angelegt sind, verschiedene kulturelle Grenzen zu überschreiten. Frieds umfangreiches Werk macht deutlich, dass Mythologie und Wissenschaft unauflöslich mit Glaubenssystemen verwoben sind und ständig im Dialog bleiben müssen – so wie die Kunst dem Leben folgt und das Leben der Kunst. Die Grosse kunstausstellung 2015, Museum Kunstpalast Duesseldorf, Rheinische Post. Images from Invitation card: Robert Rauschenberg, David Fried, Günther Uecker, Steven Pippen. Monograph David Fried "Far from Equilibrium"